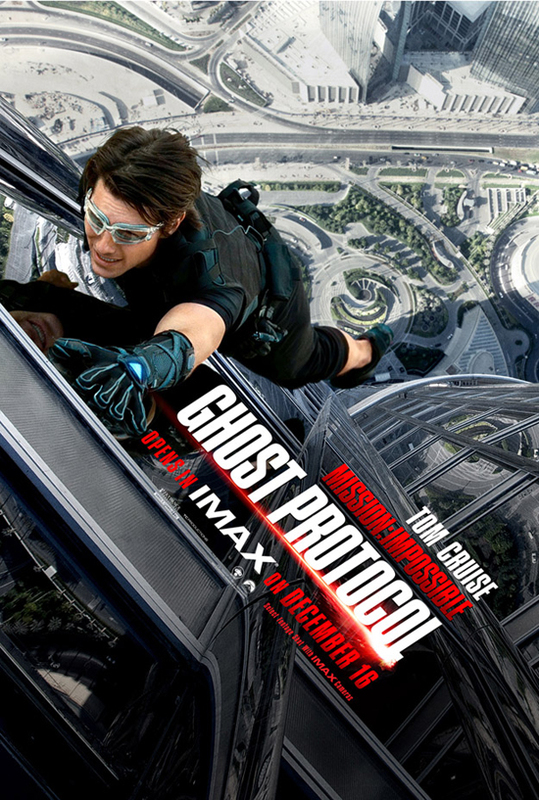 Paramount Release New IMAX Poster for 'MISSION IMPOSSIBLE: GHOST PROTOCOL'! Paramount have released a new IMAX poster for Mission: Impossible - Ghost Protocol via Yahoo!Movies. The movie directed by Brad Bird stars Tom Cruise, Jeremy Renner, Simon Pegg, Paula Patton, Josh Holloway, Michael Nyqvist, Vladimir Mashkov, Lea Seydoux & Anil Kapoor. The poster features Cruise hanging off the tallest building in the world, the Burj Khalifa in Dubai. The movie previews in conventional & IMAX theaters this December 16th before full release this December 21st. I'm reading: Paramount Release New IMAX Poster for 'MISSION IMPOSSIBLE: GHOST PROTOCOL'!Tweet this!